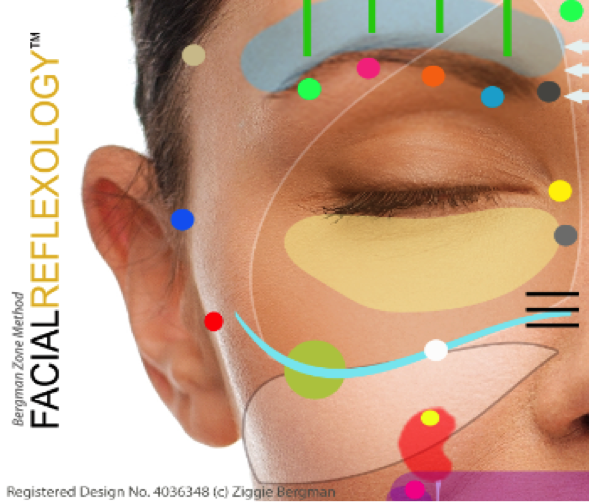 Bergman Method Facial Reflexology is built on a combination of Native American techniques and Asian body maps that chart the reflex points on the face, rather than the foot or the hand. It therefore has all the same benefits as foot reflexology but is performed on the face. However the unique benefit is that not only does it aim to help improve health and wellbeing, it can help you to look younger, less stressed and give you a lovely healthy glow. The treatment encourages lymphatic drainage, increases blood flow and muscle tone, , stimulates the facial nerves, helps to build new skin tissue and improves skin tone. So not only do you feel good after a treatment but you look good too! During the treatment you lie down fully clothed. Your hair will be smoothed back and protected by a headband. Then the skin will be cleansed free of make up (apart from mascara) and a few drops of natural oil will be applied to the face. The treatment begins with some relaxing massage techniques followed by a full sequence of gentle moves to stimulate all of the reflex points on the face. The whole treatment is wonderfully calming and clients generally experience a deep sense of relaxation throughout the session.